MALCOLM Turnbull is a threat to the Labor Party and Tony Abbott is a "decent man" but was not a "great prime minister", according to former PM Bob Hawke. 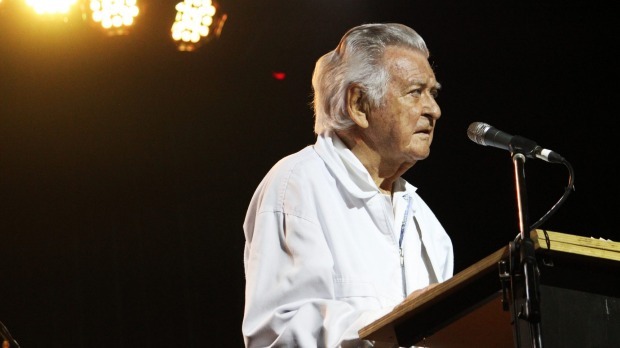 In a wide-ranging speech to Australia's biggest folk festival on Monday, Mr Hawke also called for Australia to increase its refugee intake and recognise Indigenous Australians in its constitution. Pundits rushed to compare Prime Minister Malcolm Turnbull with the former Labor national leader when he took office in September. Labor even launched an attack on Liberal National Party-held seats in Queensland in a bid to capitalise on what it termed the new PM's "Queensland problem" and counteract the Coalition's popularity jump. When asked whether the Member for Wentworth was a threat to his party, Mr Hawke replied "of course he is". But he was far less effusive of the PM's predecessor, who he said "wasn't a great prime minister but he was a decent man". Is it time to bring Tony Abbott back off the bench?